Let me speak of the greatness of this master of the teachings. He has arisen as part of the magical web of timeless awareness, the inexhaustible and ongoing adornment of the enlightened form, speech, and mind of all victorious ones. He is a great universal monarch among those with spiritual attainment and is in no way separate from Padmasambhava, the second Buddha. Our holy and venerable guru, Orgyen Kusum Lingpa, who is also known as Padma Tumdrak Duddul Dorje Rolpatsal, possesses the supreme and unconditional compassion of the sovereign Lord Vajradhara. Here I can only provide a few drops from the vast ocean that is his life story, simply to ensure that the subject is not ignored completely. There is a prophetic passage in the hidden treasure, or terma, transmission of the great revealer of hidden treasures Nyima Drakpa, which states, "In the norther region of Achakdru, to a family of those who practice vajrayana, he will be a latter-day rebirth of Lhalung Palgyi Dorje. Born in the year known as 'guarding wealth,' he will bear the name Oddiyana [Orgyen in Tibetan]. He will have five moles on his abdomen. In the year of the wood dragon, in the region of Achak, he will reveal the hidden treasure of a mandala of deities, of nine gone to bliss, so that happiness and well-being will increase in the land of Tibet and the suffering of Achakdru in the north will be dispelled." The fifth Dzogchen Rinpoche, Mingyur Namkhai Dorje, prophesied, "An emanation of Vajrapani will appear in the year known as 'guarding wealth,' a son named Tumdrak in the region of Achakdru to the north. Born to a family of those who reveal hidden treasure teachings of the vajrayana, he will blossom like a lily and then unleash himself like a thunderstorm. He will establish a center for the practice of the vajrayana teachings of the supreme secret in the Ma valley and have legions of heroic students, both lay and ordained, ensuring that the teachings of the Victorious One flourish to the utmost. He will guide all those connected with him to Sukhavati, the Realm of Bliss." There is also a prophesy from the previous Dodrup Rinpoche, which runs as follows: "To the north of this region, in an area guarded by yaksha spirits, the province of Golok, will appear one indistinguishable from the lord protector Padmakara, one bearing the name of the one will five tufts of hair, one who will engage in the sense delights of the mudra. He will be one who will cause the teachings to flourish and beings to experience happiness and well-being. His retinue will be both the 'red hat' and the 'yellow hat' schools. In a park-like environment the blessings of Padma will pass to him. In the places in which he practices the blessings of the Three Roots will gather like clouds. All efforts at making prostrations, offerings, and circumambulations in these places will prove fruitful." The revealer of hidden treasures Apang Tertön prophesied, "... at that point, a manifestation of Denma Tsemang will appear in Achakdru. He will have the good fortune to master three stories of hidden treasure teachings. He will be born in a dog year, into a family of vajrayana practitioners, and will bear the name Oddiyana. If he is able to reveal a hidden treasure of Manjushri Yamantaka, this will ensure that the teachings of the Victorious One will become exceedingly great. All who are connected with him will be guided to the pure realm of Khechara, the 'enjoyment of space.'" Another prophecy is one issued by Choktsang Dotrul: "With mastery over three stores of hidden treasures, a mad revealer of such treasures will appear in Achakdru; he will bear the name Oddiyana and be born in a dog year. All those who establish a connection with him will certainly be guided to Padma Ö, the realm of Lotus Light." Finally, in the prophetic hidden treasure of Üza Khandro we read the following: "An emanation of Padma's enlightened mind in the region of Achakdru, a son named Oddiyana Lakshmi, will appear, a person riding on the wood dog." In accordance with these and many other prophecies in hidden treasure teachings, Orgyen Kusum Lingpa was born into a clan of the lineage of Apo Dong, one of the greatest of the six early clans of Tibet. His family line is that known as the Walshul, considered the most excellent of the eighteen branches into which the Dong clan is divided. His father was Chöngak Lhundrup Gönpo, an emanation of Padampa Sanggyay of India and an excellent practitioner whose coming had been prophesied by numerous holy masters. His mother was Padma Yutso. Their son was born in the wood male dog year [19?? ], known figuratively as 'real substance,' the eighth year in the sixteenth sexagenary cycle since the inception of this calendar in Tibet. He was born amid many marvelous signs on the Magyi Metok (Flowers of Speech) Plateau, an area controlled by the chieftain of Achakdru. While he was still in his mother's womb, he had a clear vision of a column of white cloud that spread out into a thousand branches with a buddha on the tip of each. He heard these thousand buddhas chanting the Vajra Guru mantra and his body was sufffused with a blissful sensation. For a period of seven days after his birth, everyone in the family all heard the infant repeating the six-syllable mantra [Om Mani Padme Hum], the greatest of all mantras. At the age of three the child received the vow of refuge and formal tonsure from the ninth Panchen Lama, the great and omniscient Chökyi Nyima, who conferred upon him the name Orgyen Puntsok Gönpo. He also received the blessings of Tsultrim Dargyay, the monk of Tra, during that year, and this master told him to keep the name bestowed by the Panchen Rinpoche because of its great and auspicious significance. When, at eight years of age, he began his studies with his paternal uncle, Sönam Khedrup, he immediately had a vision of joining a group in the presence of the Lord Maitreya, the coming buddha. In this vision, the splendor of the white robes we wore outshone the robes worn by the many monks gathered there, and everyone showed him honors. On another occasion he had a vision of a golden stupa, the radiance of which filled the universe, and inside this he beheld the great Tsongkhapa, Lozang Drakpa, as the epitome of the lord protector Manjushri, his form radiating an unparalleled radiance. From this point on, the child understood rituals and other texts he was reading without having to study them. On several occasions he experienced visions of meeting the venerable Milarepa. When he reached the age of thirteen, the boy received from Lama Sönam Khedrup of the Washul family the preliminary practices of the Heart Drop of Longchenpa (Longchen Nyingtik) cycle, the Mindroling tradition of Vajrasattva, the cycle concerning the peaceful and wrathful deities entitled Natural Freedom of All who are Connected (Tretsay Rangdrol), and the teachings on the six bardo states. Lozang Dorje, the scholar-abbot of Akong, was prophesied to be the dakini Yeshe Tsogyal manifesting in the form of a spiritual mentor by two other masters, Chaktrul Rolpai Dorje (who was himself an emanation of Ngenlam Gyalwa Chokyang) and Garlong Padma Duddul Wangchuk Lingpa (an emanation of Langdro). It was from this great master Lozang Dorje that His Holiness intended to receive the first level of monastic ordination, taking the vows of a novice monk. On that occasion he had a meditative experience of encountering Vajrapani in a semi-wrathful form, saying to him, "It is not for the best that you take up the saffron robes of individual liberation. You are a person who should uphold the lifestyle of a lay tantrika. When you have reached the age of twenty-seven, you will come into your inheritance—the mind-to-mind transmission of Vajrapani. The doorway to the treasury of flawless hidden treasures will burst open: the guru sadhana that is the practice of the enlightened mind of the three buddha families; the sadhana practices of the chosen deities of the nine expanses of timeless awareness; the enormous cycle of Vajrapani that is connected with Samyak Heruka; the Wheel of Red Fire cycle of Manjushri Yamantaka; the cycle of teachings on Hayagriva and Vajravarahi entitled Equal Union of All Buddhas; the three cycles of sadhana practice focusing on the venerable goddesses Varahi, Krodhikali, and Simhamukha; the cycles concerning wealth practice, such as that of Orgyen Norlha. If you are able to unlock the seal of five such treasures on a vast scale, this will ensure that the teachings of the Victorious One will be restored where they have been impaired, and thus given new life." Once, when His Holiness was gazing at the wall of a large temple, he beheld there the great master Padmasambhava, "He who Overwhelms the Universe with Splendor" (Nangsi Zilnön), who placed his vajra on His Holiness' head, whereupon His Holiness gained great confidence in his understanding of the teachings of both sutras and tantras. Then, from Akong Khenpo he received teachings on the preliminary practices of the Heart Drop tradition, the Stages on the Path to Enlightenment, the great treatise Engaging in the Conduct of a Bodhisattva (Bodhicarya-vatara), the commentary Three Levels of Ordination, the development and completion stages of Vajrakilaya practice, and the black Hayagriva "with locks of iron hair," as well as many of the teachings of Jamyang Zhepa. Following this, His Holiness stayed from three years at the monastery of Palyul Dartang. During this time he studied with Choktrul Jampal Gyeypai Dorje, who gave him teachings on all the cycles of Ratna Lingpa, the Sky Teachings (Namchö), the Union of Enlightened Intent (Gongdü), Jatsön Nyingpo, Longsal Nyingpo, and others, as well as such teachings as the cycles of the Heart Drop and the three main transmissions of the Eight Commands (Kagyay). From Dongön Tulku Karma Jikme Chökyi Sengge he received the ripening instructions on mahamudra and many teachings on the Zhije and Chöd schools. Then Jedro Önpo Lozang Namdak taught him the general teachings on the Heart Drop of Chetsun (Chetsun Nyingtik) and Heart Drop of Longchenpa cycles, and in particular bestowed upon him in a one-to-one transmission the text entitled Timeless Awareness Guru (Yeshe Lama), the Unobstructed Enlightened Intent (Gongpa Zangtal) cycle, and the teachings on the approach of "cutting through solidity" (trekchö) from the Innermost Heart Drop of Vimalamitra (Bima Nyingtik) and the Heart Drop of the Dakini (Khandro Nyingtik), both of these from the cycles known as the Four Higher Teachings on the Heart Drop (Nyingtik Yabzhi). His Holiness also studied many teachings from the Sakya tradition on the Middle Way (Madhyamaka) philosophy, the Perfection of Wisdom (Prajnaparamita) literature, metaphysics in the Treasury of Higher Teachings (Abhidharmakosha), monastic discipline and ethics, and logic. During his three-year stay at Palyul Dartang, His Holiness also received the cycle of teachings on the path of skillful means, the yogas of subtle channels and energies, from the hidden treasures revealed by Sangyay Lingpa, and the stages of development and completion from the Sacred Teaching of the Heart Drop of the Nirmanakaya (Damchö Tulkui Nyingtik) revealed by Ratna Lingpa. In addition, His Holiness studied with Dodrup Rikdzin Jalü Dorje, receiving a vast array of empowerments, scriptural transmissions, and instructions, including the Four Higher Teachings on the Heart Drop; the Two Sections; the Essence of Secrets (Guhyagarbha Tantra); the yogas of subtle channels and energies for the Heart Drop according to the oral transmissions of the Dodrup lineage; the cycles on the stages of development and completion for the practices focusing on the Three Roots; the cycles of mind, expanse, and direct transmission in the Great Perfection which were hidden treasures revealed by Jamyang Khyentsei Wangpo; the collected writings of Kongtrul Yöntan Gyatso; and the cycles of teaching on the Six Teachings of Naropa. Delighted with him as a student, Dodrup Rikdzin conferred upon His Holiness the name Padma Tumdrak Duddul Dorje Rolpatsal and showered him with praise, speaking in a prophetic manner about his future. From Dodrup Tupten Trinlay Palzangpo, His Holiness received the entire transmission of the Treasury of Precious Hidden Treasures (Rinchen Terdzö), as well as many other hidden treasures not found in this collection. Chakhung Terchen Kunzang Nyima bestowed on him the entire cycle of so-called New Hidden Treasures (Tersar), and Wura Tertön Sangdak Duddul Dorje conferred, from his own revealed treasure teachings, the cycles of sadhana practice focusing on the Three Roots and in particular the many instructions on the Category of Expanse (Longde). His Holiness studied the Hundred Thousand Commands on the Mani Mantra (Mani Kabum), Engaging in the Conduct of a Bodhisattva, the Compendium of Training (Shikshasamucchaya), and other teachings of sutra and tantra with Mani Lama Padma Siddhi. Puru Lama Kunzang instructed him extensively in many profound teachings such as the Great Perfection text Three Verses that Strike at the Key Points (Tsiksum Naydek). From a teacher named Chamdo Gyara Tulku, His Holiness received transmissions of the "Five Treatises of Maitreya" and such tantras as those of Chakrasamvara, Guhyasamaja, and Vajrabhairava. And from Gojo Ratri Tertön, also known as Tertön Jangchup Dorje, he received a one-to-one transmission of the empowerments, teachings, and direct transmission instructions for the profound cycle of that master's hidden treasure of enlightened intent, a cycle focusing on Manjushri Yamantaka and entitled Vanquishing All Malevolence (Dukpa Kunjom). His Holiness then traveled to Lhasa, where he stayed for some three years at a monastic college of Sera Tekchen Chöling. During his stay he studied five large volumes of source texts and commentaries with such teachers as the great scholar and abbot Khenchen Jamyang Choklay Namgyal; his studies included the Middle Way philosophy, the Perfection of Wisdom literature, abhidharma, discipline and ethics, logic, and other topics. He also received empowerments and scriptural transmissions for many classes of tantra, such as the Most Secret Aspect of Hayagriva (Tamdrin Yangsang) and the glorious Chakrasamvara. During the winter lectures on the works of Jamyang Zhepa, His Holiness studied with the scholars, who transmitted to him the Sixteen Spheres (Tigle Chödruk) of the Kadampa school and many of the so-called golden teachings that have been transmitted within the mainstream of the Sakya lineage. He also had the opportunity to study with His Holiness the fourteenth Dalai Lama, Tenzin Gyatso, from whom he received the kindness of many profound teachings, of empowerments and scriptural transmission for such deities as the Jinasagara form of Avalokiteshvara and the Khechari form of Vajrayogini. 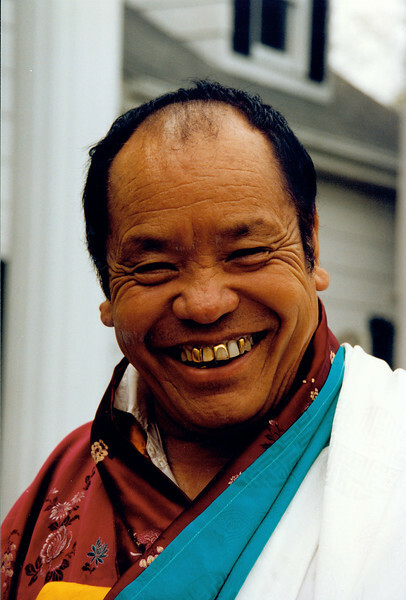 He received the Mindroling tradition of Vajrasattva from Minling Chung Rinpoche, and from Ngakchang Rinpoche of the Sakya school the empowerments, scriptural transmissions, and teachings on the stages of development and completion for Khechari according to the tradition of Ghantapada. As well, he was able to meet His Holiness the tenth Panchen Lama, Chökyi Gyaltsen, through whose kindness he received such teachings as the One Hundred Deities of Tushita (Gaden Lhagyama) and the transmissions of the six-armed form of the protective deity Mahakala. Among the other teachers whom he had the fortune to study with were: Dzongsar Khyentse; Dilgo Khyentse; the holder of the golden throne of Gaden Monastery; the sixteenth Karmapa, Rigpai Dorje; Ahang Tertön; Tsangdrup Jampa Chödzin; Dongön Lama Mönlam Zangpo; Jonang Lama Rinchen Dargyay; Khenpo Sang-ngak of Lamkho; Sharö Lama Tsultrim Namgyal; Dungkar Ngedön Gyatso; Tulku Dorje Dradul; Katok Siti; Moktrul Jikdral Choklay Namgyal; the sixth Dzogchen incarnation; Drupwang Padma Norbu [His Holiness Penor Rinpoche]; Tulku Do-ngak Nyima; Gyangwa Maday; Tsepche Tulku Rinchen Drakpa; Ma Rinpoche of the Taklung school; Lord Adrak Lama Nangsel Namkha Gyaltsen; Patrul of Tso; and many others. In all, His Holiness Kusum Lingpa studied at the feet of some one hundred and fifty lamas of all schools without sectarian bias, receiving a veritable ocean of teachings on the sutras and tantras that are the sources of the ten scholarly and eight practice-oriented lineages in the Land of Snows. In particular, he received the ripening empowerments, liberating teachings, and supportive scriptural transmissions for all of the teachings—historical transmissions (kama), hidden treasures (terma), and pure visions (dag-nang)—of the early translation school of Nyingma, which comes down to us through the kindness of the scholar and abbot Shantirakshita, the master Padmakara, and the spiritual king Trisong Detsen, and has been transmitted from mouth to ear by a million learned and accomplished masters. He not only journeyed to the far shore of this ocean of the study and hearing of teachings; he also brought his meditation and spiritual practice to full measure, freeing his own mindstream through realization and then freeing the mindstreams of others through compassion, gaining mastery over inexhaustible qualities of the three secrets of form, speech, and mind. From the age of seventeen up to the present, His Holiness has visited Lhasa some five times, and has made pilgrimages to visit all the major and minor monasteries and all the sacred sites in the three regions of western Tibet and the four divisions of the central provinces of Ü and Tsang. At these sites he has engaged in a great deal of spiritual practice. To the east of his homeland, in China he has visited the Five-Peaked Mountain, Beijing, the Ramping Elephant Mountain, the City of Fragrances, and all of the major sacred sites, as well as more than ten major monastic centers. Similarly, he has been to many of the monastic centers of the eastern Tibetan provinces of Kham and Amdo—the three centers of Katok, Palyul, and Dzogchen, the four major monastic centers in the northern steppes, and others. At such sites he has performed prostrations and circumambulations, carried out spiritual practices, and ensured benefit for beings on a vast scale through his revelation of hidden treasures. From the highest summit of Mount Kailash, which touches the sky in western Tibet, to the lowest elevations where mighty rivers join the great oceans, His Holiness has turned the wheel of the Buddhadharma to an enormous extent, teaching countless people of different races and cultures and language groups and caring for them with his enlightened activities, so that his name has become renowned throughout the ten directions. As for indications of his spiritual attainments, I have already noted the visions he had before his birth and when studying reading and writing, so there is no need to repeat myself. On another occasion, when His Holiness was seventeen, he was visiting the miraculous temple of Mingyur Lhundrup at Samye, and there he had recall of former times, when his mindstream was incarnate as the great Indian mahasiddha Ghantapada and in Tibet as the dakini Yeshe Tsogyal, Langchen Palgyi Sengge, the scribe Dangma Tsemang, the translator Drokben Khye'u-chung Lotsawa, Lhalung Palgyi Dorje, Rikdzin Nyima Drakpa, and others. He could recall many events from these previous lifetimes, such as when he was guided by Guru Padmakara, when he invited many scholars and siddhas from Buddhist India, and when [as Lhalung Palgyi Dorje] he assassinated the evil Tibetan king Langdarma by shooting him with an arrow. It was while he was at Samye that he also had a meditative vision of a palace of fire blazing in the sky above, within which the teacher Zhönnu Pawo Topden dwelled, conferring blessings and empowerments on him; in addition, the teacher released the seal of entrustment for His Holiness' hidden treasures. His Holiness wrote down a record of all that transpired during this experience. On another occasion, when His Holiness had journeyed to Makhok, an Indian sadhu-like figure seemed to come out of nowhere and bestowed on him a mantra for Vajrapani that would stop frost, hail, and rain. Another time, he dreamed of thirteen goldent dragons cavorting amid an expanse of white clouds; he rose above them to reach an enormous Buddhist temple with a beautiful golden spire. In another dream he beheld the dakini Yeshe Tsogyal, her form half-hidden amid an expanse of white clouds, purifying him with a ritual ablution. He also dreamed of the upsetting experience of all the gods and demons of the three-thousand-fold universe partaking of his flesh, whereupon the great siddha Tangtong Gyalpo led him by the hand and he came to the heruka temple in the realm of Oddiyana, where a large number of texts were conferred on him. In the Doyi Aru forest near the monastery of Drupchen, His Holiness dreamed that he met Longchen Rabjam, whose form filled the sky, and that a rain of many Buddhist texts fell from the sky into his hands. This holy master enacts the four kinds of enlightened activities without impediment, for the Three Roots and the oath-bound guardians follow him like a shadow follows the body that casts it. There are many accounts of how he has provided protection and refuge to those who uphold their samaya, or how he has punished those who break samaya, but His Holiness has for the time being refused to grant permission for these to be written down. There are, however, very well-known accounts of him causing rain to fall at Lhundrup Teng in the region of Derge; of him raising a turquoise dragon from the earth in the Shingnak valley of his home region; of him resurrecting an old man of Sendrong named Chimay Dorje, who had died of leprosy, simply by touching the corpse with his hands. His Holiness has also cured ten lepers and tens of thousands of sick people by using the practice of Vajrapani from his own hidden treasure revelation, producing results that all can see. He provided protection from danger to families dislocated during the Chinese cooperative reorganization. Intelligent people can fathom the nature of his activities, which are indicated by the fact that his name has become famous everywhere nowadays. Other stages of his excellent activities include offerings to the statue of the Lord Buddha in the main cathedral of Lhasa—two measures of gold for the crown, two thousand seven hundred yuan worth of brocade for the robes, and five hundred measures of butter for the lamp offerings. To the statue of the Buddha called Lord Mikyö Dorje, he offered robes worth one thousand yuan. At the monastery of Drepung Drayang Ling, His Holiness commissioned a large gold and copper statue of Guru Rinpoche. He offered two thousand five hundred yuan for the support of projects at Dodrak Monastery. He made tea offerings to the general communities of monks at the three great monasteries of Sera, Gaden, and Drepung, as well as in Lhasa itself. Similarly, he has sponsored projects and established connections at all of the major monastic centers of the central province of Ü and the eastern provinces of Amdo and Kham, as well as in China. When he met with His Holiness the tenth Panchen Lama, Kusum Lingpa offered a fine scarf of white silk, followed by an extensive mandala offering. The Panchen Rinpoche was delighted and spent a long time in conversation with him on spiritual topics, after which he presented Kusum Lingpa with the robes of the previous Panchen, as well as his own picture and a personal letter; these are still kept as precious mementoes at Kusum Lingpa's monastery. In point of fact, His Holiness Kusum Lingpa's monastery had for more than one hundred and fifty years been an encampment of black felt tents that moved from place to place, never staying in any one location. There were reasons for this: the inhabitants of this region of Golok Akyong are nomads who live in such tent communities, and so they are always on the move. According to local history, there was also continual threat from invading Mongol tribes, making it impossible to establish any fixed location for the monastery. This nomadic style of life was due to many such circumstances, both external and internal. Now conditions in this part of the world have improved, material prosperity has grown, the teachings of the Victorious One are flourishing, and the welfare and well-being of people is on the increase, due to many such conditions on the external, internal, and secret levels, a more stable foundation for building a monastery has come together, with the permission granted by the governing authorities and the gathering of the two accumulations of merit and awareness on the part of the faithful who wish to sponsor such an undertaking. The project of building a permanent site for this monastery commenced in the fire tiger year [19??]. From that time until this, only about five and a half years have passed, yet due to the magical effect of His Holiness's motivation, in this short time this monastic center has sprung up as an amazing and large-scale array on all levels: outer, inner, and secret. It is plain to everyone that such as accomplishment could only be realized through the incredible and miraculous powers of buddhas and bodhisattvas, not through the agency of ordinary people. This process was aided by the fact that all the lamas and tulkus—everyone with any position of authority in the monastery—all worked together as one in harmony, without wasting a day. In addition, no one has been permitted to "freeload" and there has been no personal gain, embezzlement, or misrepresentation in raising support for the construction project. Rather, this lama's great qualities have attracted the interest of supporters like bees drawn to a fragrant blossom; those who could have offered horses and oxen, while those who couldn't have offered needle and thread, to ensure that the support for this spiritual undertaking has increased like a waxing moon. The local inhabitants who have faith in His Holiness have been dedicated to providing ongaoing support, while others from further away, throughout the three provinces of Amdo, Ling, and Kham, have proved to be as reliable as the way things grow during the summer months, so that there has been no need for His Holiness to be forced to rely on a few who might be fickle and curry favor with shallow displays of support. He is also far above the ways of certain highly-placed individuals nowadays who take all the offerings that come to hand, whether from the living or on behalf of the dead, and hide these under the mattresses in their homes, not using these offerings as intended but handing them on to their sons or favorite nephews, or making sure that their young girlfriends have pretty baubles. In a ways that is seldom if ever encountered, one may have confidence that all that comes into His Holiness' hands by way of offerings is used entirely as a means of honoring the Three Jewels or of bringing happiness and benefit to beings. In a similar vein, His Holiness is skilled in the theory and practical application of the Buddhist medical tradition, and has been especially active working with people afflicted by leprosy, demonic possession, and various psychoses. He is famed for his generosity in relieving pain and anxiety for countless patients, without ever requiring a fee for his services. As well, he is wholly dedicated to the long-term care, both material and spiritual, of all the elderly and poor who have no resources of their own and no one to look after them. It is plainly evident that he perfects the countless ways in which bodhisattvas, the children of the victorious ones, engage in enlightened activities. Let those who have eyes look for themselves, and I feel sure that they will find that His Holiness' presence in the spiritual and social realms is not lacking in virtue in the least. In addition, His Holiness Kusum Lingpa has been responsible for the construction and fitting of any number of buildings for spiritual teachings, practice, and related activities. These include the large gathering hall of Tukpo Köpa ("Pure Realm of Dense Array"); the retreat center called Kusum Podrang ("Palace of the Three Kayas"); the major circumambulatory path called Ngöngai Temkay ("Stairway to the Realm of Manifest Joy"); the stupa Tongdrol Chenmo ("Great Stupa that Brings Liberation when Beheld"); the lama's residence called Shambhalai Podrang ("Palace of the Pure Realm of Shambhala"); the medical center of Drangsong Dupai Gatsal ("Grove of the Gathering of Seers"); the center for care of the dying and disadvantaged called Pendai Norbui Kyeytsal ("Jewel Park of Benefit and Well-Being"); and a center for secular studies called Riknay Podrang ("Palace of Fields of Knowledge"). But in point of fact, to enumerate all such projects would make this account far too wordy. Those who may wish to gain a greater sense of the extent of His Holiness' undertakings should consult my separate essay on this subject. This will suffice to give people an idea of the great and enlightened activities of this master. one volume of personal advice, such as the humorously-titled work Pinning the Flea Down with My Finger (an essay exposing the flaws of the times of spiritual degeneration), the Hero's Melody (a spontaneous song to encourage one named Kalzang Losel Zhönnu to practice the Buddhadharma), and other works. In addition, there exist many minor works and cycles of teachings composed in response to specific requests by various individuals, such as the Drop of the Dakinis of Basic Space (an illustrated manual on the making of torma offerings), the Vajra Melodies (a manual of musical notation for rituals focusing on the Three Roots), and may other such works. In all, there are some twenty-five volumes of His Holiness' collected works as they exist up to the present. This master has always given his personal assurance that from the time that he was an infant nursing at his mother's breast up to the present, he has had constant visions of the glorious Vajrapani, Lord of Secrets. He is never separate, even for a moment, from Vajrapani, who guides him, utters prophecies, confers empowerments, reveals hidden meanings, and in other ways engages in an uninterrupted process of enlightened activities. This means that His Holiness is in fact a supreme holder of the treasury of the secret of all victorious ones' enlightened speech, and the teachings that constitute his enlightened speech cannot accurately been enumerated. Still, I have provided a record of a few of these teachings that have come into the hands of us as those to be tamed by those teachings, and it will be entirely appropriate to add such teachings as come to light in the future. Of the main students of His Holiness Kusum Lingpa, the following are those who have been both his teachers and students, or who are custodians of his teachings or in some other way foremost among his students: Akong Khenpo Lozang Dorje; Katok Moktsa Jikdral Choklay Namgyal; Lhapzo Lama Damchö; Choktrul Nyida; Katok Lama Lhunli; Dora Lama Lochö; Jonang Lama Lodrak; Tokgi Lama Padtse; Sanglung Tulku Kalzang Dorje; Wangdai Gyangtrul Döndrop Dorje; Dibar Chöjay Loyak Tulku; Choktrul Garwang Nyima; Khenpo Zhilii Tendzin Zangpo; Gyalsay Padma Tsewang; Mukyang Khenpo Lozang Tsultrim; Kirtii Geshay Takrang Könchok; Amo Lama Wangrap; Khangsar Dazer; Dzogchen Khenpo Tsering Nyima; Lama Paldrak; Dodrup Khenpo Ngaksher; Ragyai Lama Khyenrap Gyatso; Derge Pewar Tulku; Rekong Kyaplo; Tulku Godey; Barchung Sangdrak; Mukyang Tuden; Durbü Ngawang Rikdzin; Chung Opo; Katok Khenpo Padma Chöjor; Chyaktsa Tulku; and many others, the majority of whom are custodians of the cycles of His Holiness' hidden treasure revelations. As to those students who have a spiritual connection through requesting teachings, I have heard reports of there being many thousands of lamas and monks, and some one hundred and thirty thousand lay men and women.